Agios Sostis, in the next bay along from Laganas Beach, is one of the most beautiful little resorts in Zante. The tavernas and restaurants offer beach side patios and a good variety of food and make this resort very picturesque for the day or the evening meals and drinks by the sea. Some of the Greek nights at this resort are a unique experience in Zante with a lot of Greek dancing and a real Greek Atmosphere. 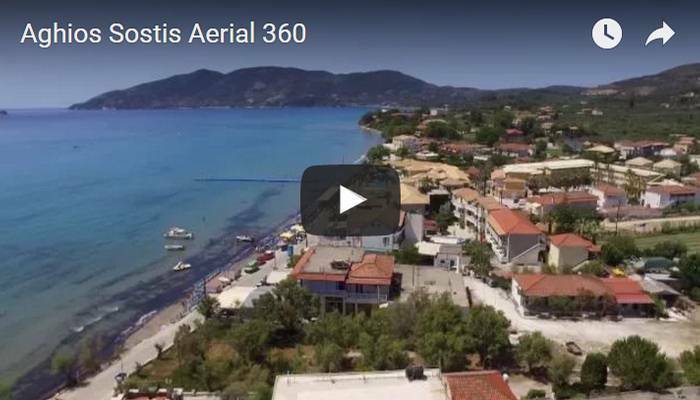 The narrow beach of Agios Sostis has all the facilities of a main resort, like boat hiring for visits to Marathonisi island and the Keri Caves, pedaloes, canoes and of course deck chairs and umbrellas for hire. Agios Sostis is not a very busy resort but is close to the big resort of Laganas with its 24hr lively atmosphere, so if you want more action you are close enough to walk there.